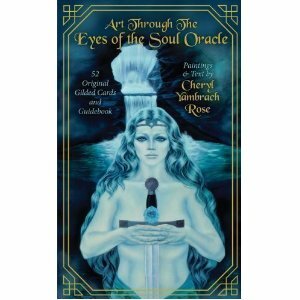 “Art Through The Eyes of the Soul” is a 52 card oracle deck, accompanied by a 108 page companion book. The presentation is true quality – the cards and companion book come in a hard cardboard box with a lift off top. The image on the top of the box is that of the Lake”, which is also used on the cover of the companion book. On the back of the box is information on the deck, along with a small illustration of the card back. Did I mention that this deck is gilded? This deck would have been awesome without the gilding, but the gilding adds a sense of magic and “otherworldliness” to it. Kudos to the author/illustrator, and kudos to U.S. Games Systems, Inc.! 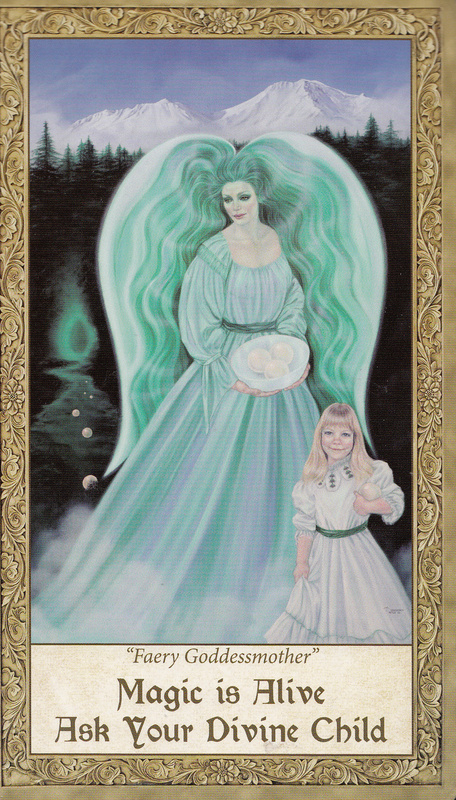 Rose suggests that meditating with the images connects the Seeker with the energy field of the location where the painting was conceived. 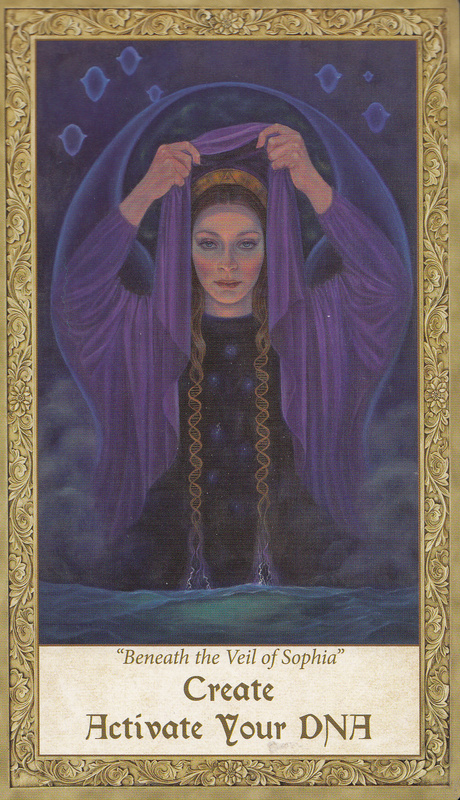 The Seeker weaves their own fate by tuning into their higher self and allowing that spontaneous connection to answer their question or suggest advice. 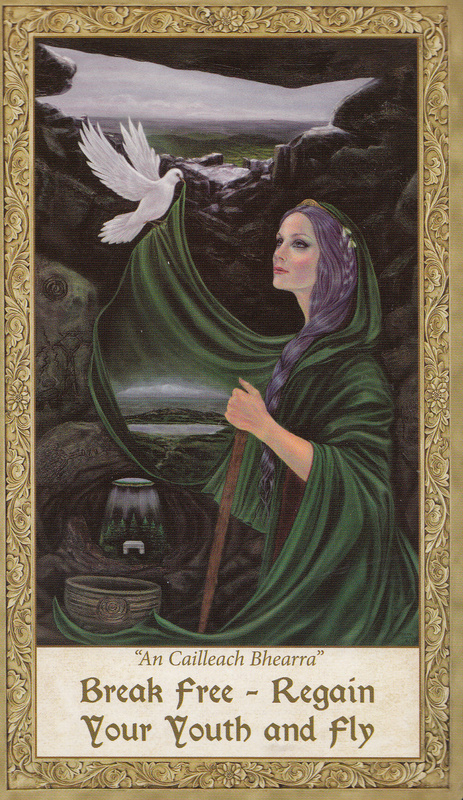 Drawing a single card to ask for daily guidance, or to use in meditation, acts as a catalyst to the Seeker’s own thought process. There are also iPhone and iPad apps for this deck that include music and animation. It is suggested that the cards be cleared before using them the first time, using either incense, or smudging them with sage. It is also suggested that they be placed on the Seeker’s sacred alter, along with other objects that are charged with significance by the Seeker’s own thoughts and intentions. 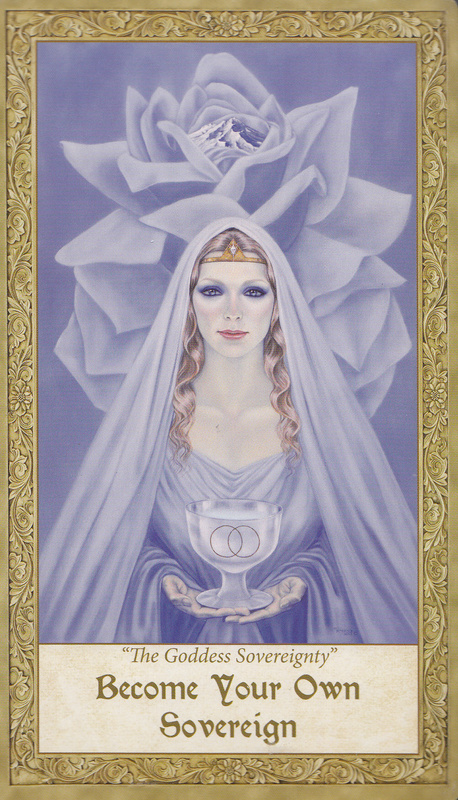 The cards will absorb the Seeker’s vibration, allowing them to become a powerful personal tool. The bag may then be placed in a velvet bag, or some type of container, to hold the essence of the Seeker close. It is advised that the Seeker not allow anyone to play with the cards, or to treat them disrespectfully. 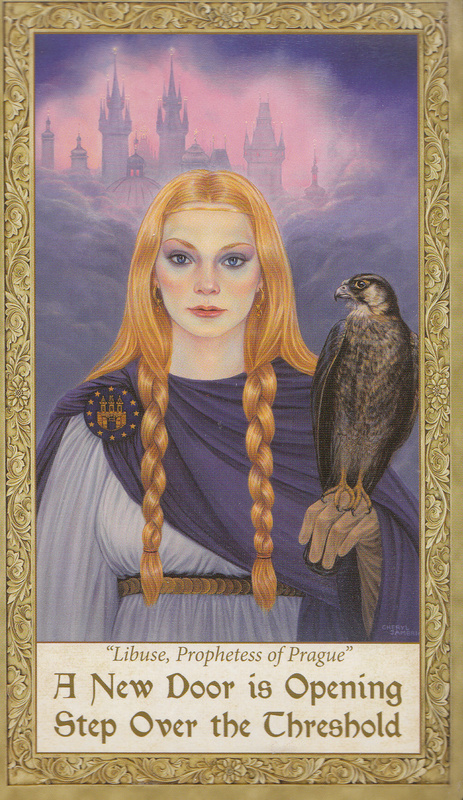 The companion book shows each card with a black and white scan, card title and date painted, an expanded meaning, and the story behind the card. 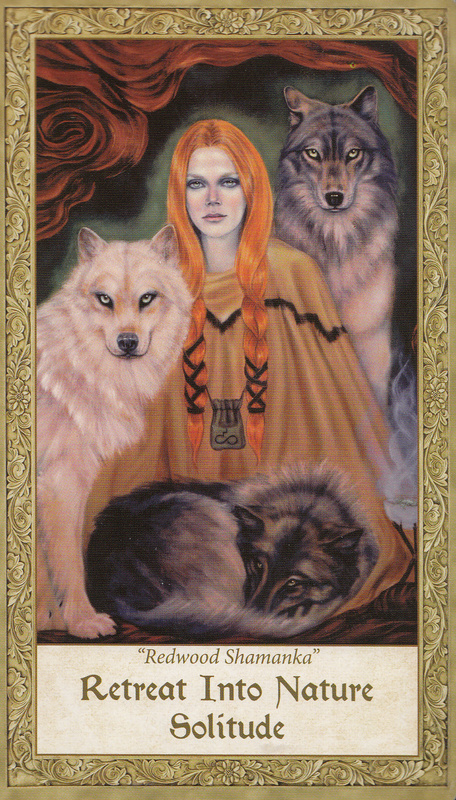 Card subjects include Anastasia, Ariadne, Sophia, Eriu, the Goddess Sovereignty, the Glastonbury Goddess, the Hermit, Iona, Lady of the Lake, the Lord of Lyonesse, Merlin, Oceana, Redwood Shamanka, the Third Pillar, Wolf Child, and more. The cards are approximately 3 ½” by 6”, of glossy card stock. 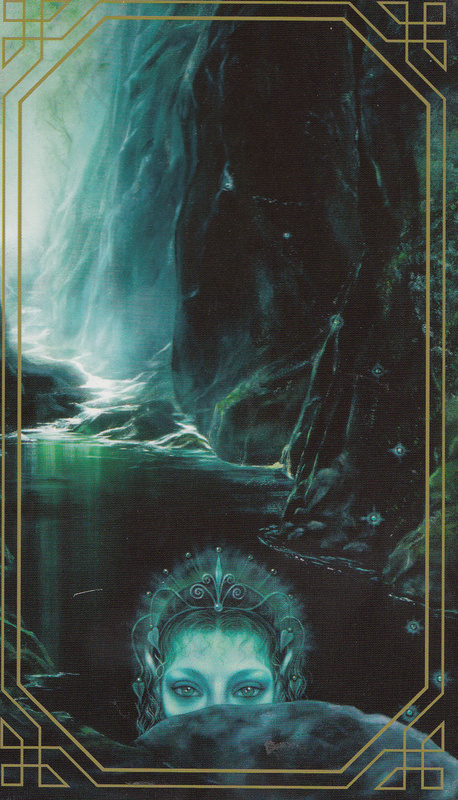 The backs show a blue/black cave like setting, showing a path moving into light on the left hand side of the card. 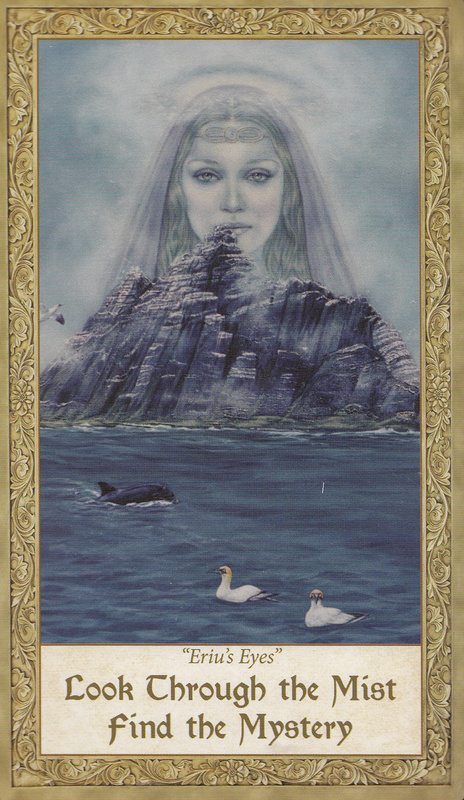 At the bottom of the card we see the eyes and forehead of a female figure, wearing a decorative headpiece. There are two thin gold lines around the edge of the card, with gold imagery at each of the four corners. The edges of the cards carry a gold gilt. The card faces have a ¼” plain gold border, followed by a ¼” gold border with imagery. At the bottom of the card is a cream colored block showing the card title and a key concept. 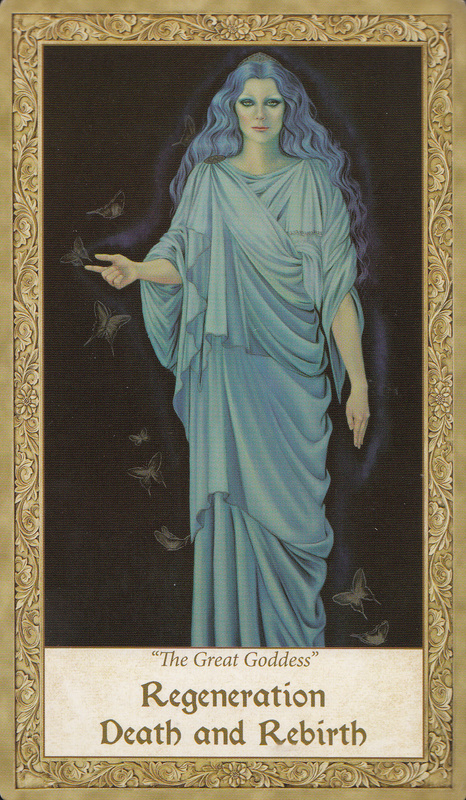 The card entitled “The Great Goddess” carries the key concept “Regeneration – Death and Rebirth”. We see a female figure, dressed in a blue gown, her left hand at her side, her right hand held out in front of her. The expanded meaning is “One life cycle ends and another begins. 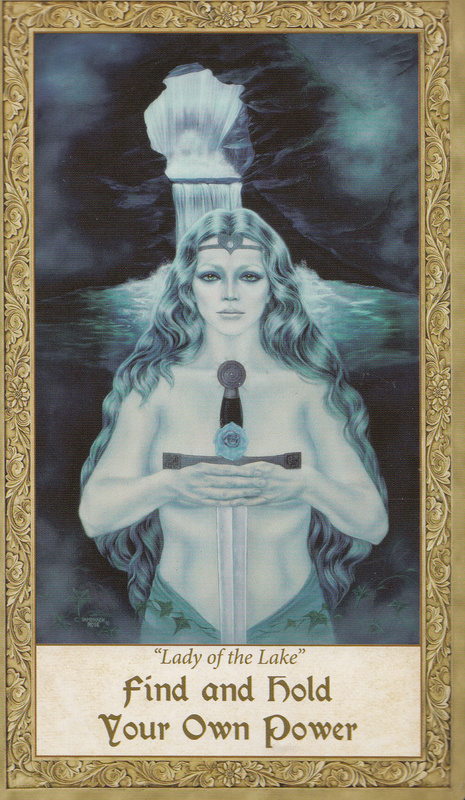 Flow with the cosmic rhythms to become the master of your own fate.” The year listed under this card is 1989. There is incredible energy in this deck – I feel that it is a valuable tool for those from all backgrounds, and those of all ages. In these cards we see the world of myth and magic – it become so real to us that is feels like a parallel world, a parallel reality. This is a wonderful deck for these changing times! I SAW THESE CARDS FOR THE FIRST TIME AND AM IN THE PROCESS OF GETTING MY OWN DECK, THE CARDS TAKE ON AN ENERGY OF THERE OWN IT WAS GREAT.